Logging in to the APeX site gives you access to members only files like BoD meeting minutes. Your account is linked to the email that you signed up with when you joined. If you have an email @gmail.com, you can just login using your credentials from your existing account. Google provides an authentication system which allows you to login to the APeX website without us ever seeing your password, and without having to remember yet another password with us. Any time you change your Gmail password, you’ll login with that NEW password at this site. Note that at one time, APeX supported logging in using a Yahoo or AOL email address. Both of these services altered or discontinued their third-party login service, so only Gmail is supported at this time. To login with Gmail, click the “G” logo. You will be asked to confirm that you want to allow access to the APeX website, and may need to type your email account’s password. 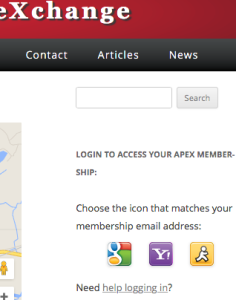 Once logged in, your account will be remembered in your browser so you can access the APeX site quickly in the future. If your APeX account isn’t associated with a Gmail account, the easiest way is to setup a Google ID on your current email account. Google allows you to create a login using your existing email address without requiring that you get a new mailbox at the gmail.com domain. To create a Google account, go to https://accounts.google.com/SignUp and choose the “I prefer to user my current email address” option. Use the email address that your APeX account is setup for. You’ll get an email to confirm that the address really does belong to you. Once you click on the link in that verification email, you’ll be able to login to APeX using your new Google account on your existing email address as shown above.
. We can look up your account and update your registered email in case it’s out of date. APeX will never use any information from your login account to access any of your contacts or otherwise bother anyone you know. When you login, the APeX website requests access to your email address and basic profile information. That information varies depending on which service you use, but it generally includes your name, email address, avatar image, and any profile information you’ve explicitly marked as PUBLIC. APeX only makes use of your email address, avatar image, and possibly your name. For existing APeX members, we DON’T use the name on your account and continue to use the scene name you gave us when you joined. If you login to the APeX site using an email account that isn’t registered to an APeX member, we’ll create a new guest account for you using your name and email address. Your avatar image is displayed on the APeX site toolbar to welcome you and is shown next to any comments you might leave on any pages on the site. APeX never requests or accesses emails you’ve received or sent, your address book, or for the ability to send email on your behalf. We’ll use your email address to send announcements directly to you (you can opt-out any time), but that’s it.